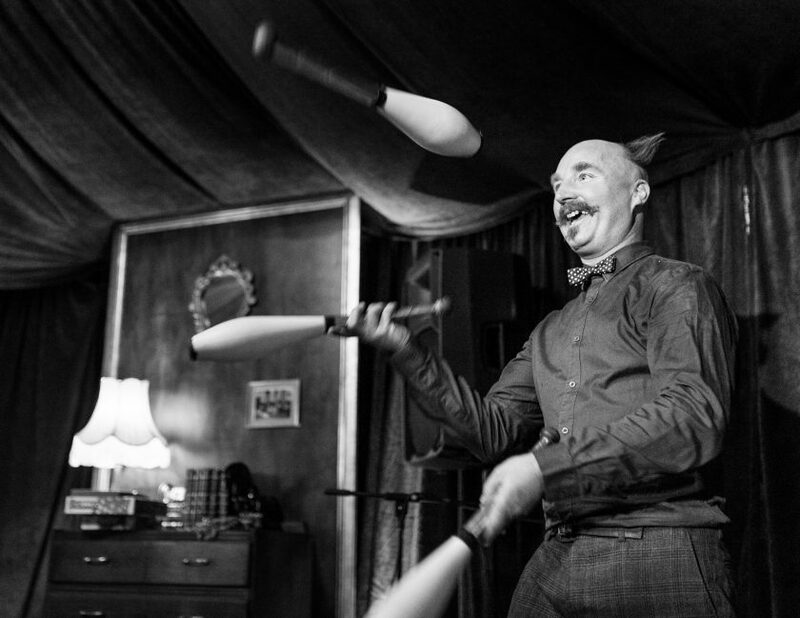 The show is a highly skilled, comic vaudevillian style street/circus act. He performs a beautiful three-ball juggle, Chinese devil-sticking with baseball bats, one ball manipulation and an seven ball juggle, mixed with mad capped antics and an incredible sense of fun, not to mention a few hat tricks thrown in! This all culminates in him jumping on to an eight-foot zigzag unicycle (of his own design) from which he juggles three baseball bats while balancing a glass of water on his head! Nigel Martin is a comic vaudevillian performer who has been entertaining large and enthusiastic audiences worldwide and in his hometown of Adelaide for the last 20 years. With his ferocious energy & endearing, charismatic wit, Nigel is a true comic genius and one of Australia’s finest jugglers. With a background in classical dance and inspired by Vaudeville greats Enrico Rastelli & Francis Brunn, Nigel has focused on developing high level skills, impeccable timing, fluid movement and his own quirky style of comedy. Nigel can be seen under other guises performing with ‘Slack Taxi’ and Australia’s Lunar Circus. He was spotted by Australian film director Rolf de Heer while performing in Adelaide and cast to play the lead role in ‘Dr Plonk’. This ingenious film received 5 star reviews around the globe. He is the brains behind the unique design of the Bamboozled venues, and also composes the music for most of his performances.